Someone left a copy of a 2007 National Geographic article about the Tongass National Forest on my deck. Thank you. I’m guessing that you are sending me a message regarding my last two posts on loading logs onto a ship, and logging in general. I grew up during part of the logging era in Southeast Alaska. My feelings about logging, as I mentioned in a previous post, are complex. While I celebrate the work that people have and do in the timber industry, my heart aches at the sight of acres of trees reduced to bundles loaded onto an oceangoing ship. My opinion is that cutting our precious old-growth forests down for short-term jobs is a mistake, but it’s not all that simple. So this wordy post breaks with this blog’s tradition of light picture-stories, and digs a little deeper. The K-Pulp photos were taken by my Mom. Here’s one of the buildings at the Ketchikan Pulp Mill in the 1950’s. One of my grandfathers was a cutter. He cut the first tree to clear the site for this mill, and he got his picture in the paper. My other grandfather did some engineering work for the mill, including work on the dam for the mill’s water source. He got a nice picture of the dam to hang on his wall. The mill was built by men but formed out of the politics of the time. As usual, the roots of those politics were formed earlier yet. Even in 1929 the forest here had been selectively harvested for decades. The biggest, best, and easiest trees had been taken. Later, in the 1940’s, the timber in Southeast Alaska was considered a matter of national security. The fine, straight grained spruce was important for building aircraft. During WWII some loggers were not allowed to enlist in the military, and were ordered to continue working to supply aviation grade spruce. I grew up with older people telling me about over-mature forests falling down and rotting. It was a terrible waste, they said, best to cut the wood while it was prime rather than to waste it. And cut they did. A recent clearcut in Southeast Alaska. At about five to fifteen years after harvest, clearcut areas can be rich in forage for deer, as well as berries for bears and humans. At this stage clearcuts are very hard to walk through, though. Here in Southeast Alaska the Tongass National Forest was said to be on a 100 year rotation. As the last planned cuts of old growth timber fell, the first areas that had been cut would have trees mature enough for harvest. In my youth I was on board for this ‘scientific forest management.’ A forest is trees, right? Now I see it very differently. A forest is so much more than trees, and the 100 year rotation didn’t work out that well. My uncle worked at that pulp mill in Ketchikan, but that mill and its supporting industries are now long gone. Wood resource jobs are no longer well provided for, and the last sawmills are hanging on by an old, rusty, mangled logging cable. The fast-growing, second-growth timber coming up isn’t as straight, strong, tight-grained, and rot resistant as the old growth was. This new, lower-value wood is coming to market size as timber sources closer to large domestic markets are fully supplying those markets. As the second-growth trees grow they shade out much of the forest floor for many years. The limited biodiversity makes a different kind of forest. Hearing a logging industry professional say that the only way to make money harvesting second growth in Southeast Alaska is to bring in a team of foreigners to cut the trees and then to send the wood overseas left me with a terrible, empty feeling. If any clearcutting is going to happen here then shouldn’t the locals get some benefit from it? Do we have to be left with acres of stumps and empty pockets? 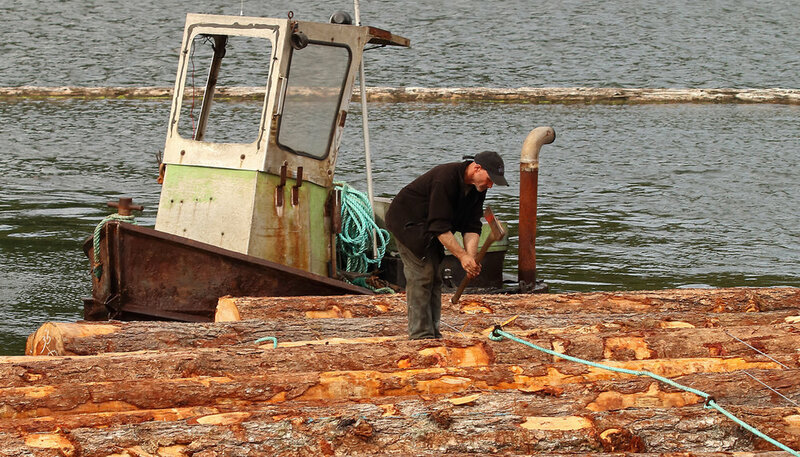 Some old growth is currently being harvested in parts of Southeast Alaska. The U.S. Forest Service has a few cuts going on in the Tongass National Forest. Some of that wood is sent to other countries. There is also logging by Alaska Native corporations and the Alaska Mental Health Lands Trust. Much of the current logging in Southeast Alaska is being done by Alaska Native corporations that are beholden to their shareholders. Mandated to maximize profits, most of the wood that they harvest is sent overseas where it can be sold for a higher price. I don’t feel that I have a right to be opinionated about what Alaska Native corporations do with their land and trees. I just celebrate the resurgence of Alaska Native culture and wish that the best of all cultures will be the norm. Native corporations can make extended clearcuts on their property. This one is on Cleveland Penninsula, north of Ketchkan. The Alaska Mental Health Trust has been granted some of the best timber land in the region to generate income to fund mental health programs. AMHT is well known here for cutting timber without regard for the mental health of locals, though, and only in recent years has there been strong enough push-back to change the locations of some of AMHT’s planned clearcuts. Through hard work, and some hardball tactics, AMHT, the State of Alaska, and the US Forest Service have arranged land trades to move some of AMHT's logging away from more populated areas. Sadly, those trades may degrade the quality of life for people in some smaller towns. Agencies are sometimes at odds. The Scenic Byway program took a hit when the Alaska Mental Health Trust logged behind the sign. I do take issue with how AMHT conducts business. AMHT is a state corporation that is mandated to maximize use of their assets to fund their programs. I feel that in-state hire should be an asset that AMHT should be mandated to draw upon. If AMHT hires people from other states to remove our forests, leaving us empty-handed, staring at stumps, depressed, and needing mental health help, then isn't that a harmful self-feeding-dynamic? Taking timber off of hillsides near roads and towns has burdened local residents. AMHT logging has left areas prone to windfall trees, taking out power lines repeatedly and leaving small communities to shoulder that expense. Without the trees to hold soil and regulate water flows on steep hillsides, AMHT cuts have also caused great concern for landslides onto roads. AMHT is developing a mine at Icy Cape which is 75 miles from Yakutat. A September 26, 2016 article by the Anchorage Daily News quoted AMHT director John Morrison as saying, "It's difficult to quantify the value of (Icy Cape) in terms of heavy minerals; it's just mind boggling. There's enough heavy minerals there to run a really large mine operation for over 100 years and we're talking about hundreds of millions of dollars every year." The AMHT website currently notes that "Over the next decade, the TLO (Trust Land Office) will also develop timber resources in the Icy Cape District, which will allow synergy with mineral resource development strategies. Work will be conducted this summer to prepare for an initial TLO timber sale in the Icy Cape District. There has been timber harvesting in the area in the past." According to their website, AMHT also has plans to continue logging operations in Southcentral and Southeast Alaska over the next two decades. I am greatly saddened that AMHT plans to continue logging at the same time that a mining project will generously fund their programs. Alaskan loggers are becoming scarce due to infrequent work opportunities, so crews are being brought in from other states to handle some of the sporadic timber sales. Our resources and industry are largely exported. The benefit to the people who live here in Southeast Alaska is dwindling. Dwindling, but not gone. For Alaskans who make their living in the current timber industry, their scarce jobs are very important. Old growth forest is very important winter habitat for deer. Old growth timber cannot be re-grown in a generation. In a meeting with US Forest Service personnel and representatives of environmental groups I asked how long it takes to turn a clearcut into an old growth forest. The short answer was that they didn't know; maybe hundreds of years, probably more. Luckily scientific forest management means more than a monoculture of trees for wholesale harvest these days. The forest is as much mushrooms, moss, fish, birds, and bushes as trees. And the trees themselves are being seen differently. We now know that trees are more than just individual plants. Fungi are very important to forests. Trees trade nutrients with fungi. Fungi also do the hard work of breaking down cellulose from dead trees and recycling the nutrients into the living forest. Mount chemical defense against attack. A healthy forest understory has a wide variety of plants. It has become obvious that Southeast Alaska trees are more valuable than just wood to make warplanes so that we can kill each other. We need a lot of living trees so that we can live. The need to have large forests isn’t just some lofty, seemingly vague ideal about saving the planet - it’s personal. So there’s the rub. Balancing livelihoods with healthy forests is difficult. Our ‘manmade’ surroundings all stem from the natural world; growing things and resource extraction. The stuff that we make has to come from somewhere and go somewhere, and we are changing a lot of stuff. We are practicing planet terraforming without an instruction manual in order to continue increasing our population. It’s pretty overwhelming, so I’ll get back to this little corner of the world; this temperate rainforest that is vital to the lives of Southeast Alaska residents. I am glad that the headlong rush to clearcut major tracts of Southeast Alaska has diminished somewhat. We may still need to cut some trees so let’s take time to approach it with thoughtfulness, great restraint, and respect. Let’s treat the remaining old growth forest as too rare and precious to log. My wish is that the forests of Southeast Alaska no longer be drawn upon at the whim of politicians and corporations. The extensive logging that took place in the Tongass during the last century left lasting consequences, both bad and good. It is not mine to sit in lethargic disgust, accusing the previous generations of pillaging resources and ruining lives. It is mine to appreciate the infrastructure that logging built, and to treat the roads and towns as a legacy to improve and build upon for our children. It is mine to use the schooling that the logging era in Southeast Alaska paid for to create a more balanced path forward. As the title says, this post includes a bunch of my opinions. I welcome yours. Please keep it thoughtful and polite. Thank you. And to the one who left me the National Geographic article - please stop by so that I can give it back to you and we can chat. This TED talk is SO interesting! Find out about trees talking, trading, creating networks and helping their young: Suzanne Simard "How Trees Talk to Each Other"